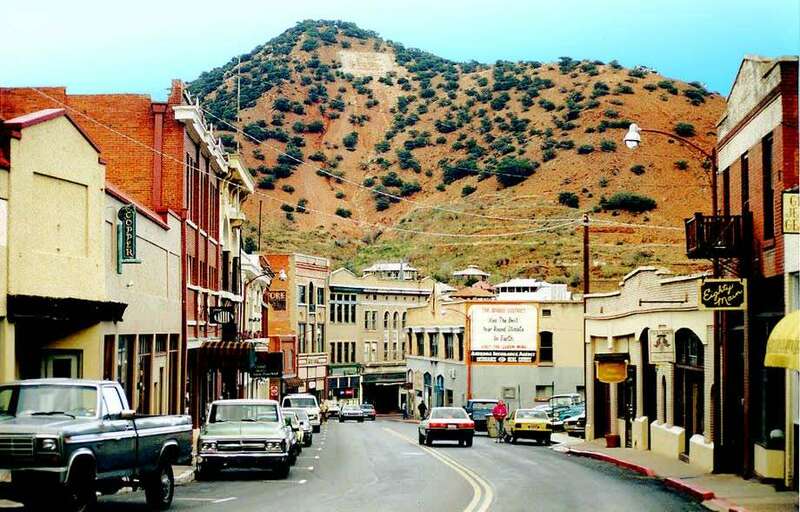 The Mule Mountains circle like a pack of their namesake huddled to protect the stacked on top of itself town of Bisbee from the harshness of ever-surrounding desert. We roll all four wheels of tin can home through the tunnel that wraps around Arizona 80 from the northwest, and immediately begin the descent into the heart of town. Houses painted in electric turquoise, orange peel and sunshine cling to the sides of the mountain, joined by older buildings dusted thick with rust. Tombstone Canyon Road, a former soap box derby track before they ended the annual races some years ago after a terrible accident, waterfalls through the first stretch of town before suddenly transforming itself into Main Street. The vintage wares of antique stores burst through the doors and into the sidewalks, floor after floor, store after store of yesterday on sale. Cacti and jewelry stores lean against one another, cowboys and hippies make their passing hellos and the houses here literally are stacked one atop another after having clamored for what limited space there is that doesn’t equate to pure cliffside. The town still looks like a scene right out of the Wild West, but unlike nearby Tombstone, it hasn’t forsaken being an actual, working town in favor of fake gunfights and horse and carriage nostalgia. In the 1800s and first half of the 20th Century, this place was a booming mining operation. Grizzled men pulled copper, silver and gold from these mountains by day, and drank, fought and killed one another by night. Makeshift shacks were built all through and into the surrounding hillsides. Incredibly high quality turquoise and other gems can still be found if one looks hard enough, though we’d have an easier time exchanging our cash for such items in a myriad of boutiques selling the “Bisbee Blue” rather than getting down on our knees and digging into the dirt. Early afternoon and downtown, a young busker named David is playing his guitar for tips from tourists. He’s working his way, somewhat sloppily, through Nirvana’s About a Girl. The song comes to a close, halfway through, and he asks me what I want to hear. “Know any Guns N’ Roses?” He laughs, then realizes I might be serious. An older man with long white hair falling out of his straw hat walks over and begins talking to me. After a few minutes of chit chat about the town in general, he tells me he lives in the back of his truck and some days later I have the good fortune to get the full tour of his home on wheels. His name is Jack and he’s got one of those campers that fits onto the bed of a pickup. Inside is a sleeping bag, a duffel, his own guitar, and a small Coleman heater. “Busking makes me a few dollars,” he recants, but it quickly becomes apparent that he is a man with little need for money. He finds odd work when he must, but can live off of a little for a long time. Back at the park in the middle of town a very young boy named Roman is playing a small guitar. It looks full size in his six year old hands, his brown and white striped shirt and cowboy hat placing him somewhere between gringo and hipster as he masterfully belts out the blues. 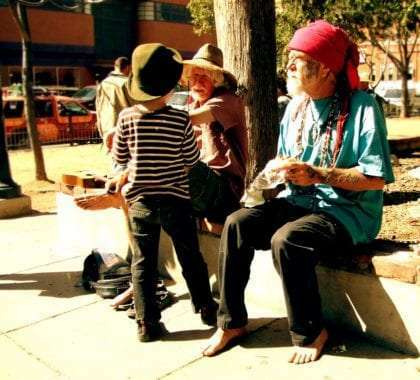 His mom is talking to a man selling jewelry on a park wall, his face covered in a tattoo of the tree of life, his long grey dreadlocks bound up by a giant red rag around his head. He tells me his name is Robert, but most people call him Dragon. He joins me for a drink in a local bar, though he himself doesn’t partake in alcohol, we talk about the son he lost and his younger, wilder days. He seems to genuinely care for me, or perhaps just people in general, though we’ve just met. Over the years I’ll see him again while visiting town and will always look forward to seeing that giant smile form between the lines of tattooed ink on his face. Roman and two men I'd come to call friends. As afternoon flirts with evening the various bars in town are already filling up. Older couples who bought Harleys to spend retirement on two wheels mingle with leather clad Hell’s Angels types. 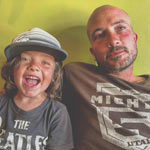 Punk rock kids leave their jobs as tattoo artists by day to drink alongside tourists down from Tucson for the weekend. Pint after pint of local Dave’s Electric Beer are poured and emptied while the smell of marijuana smoked rather freely throughout the streets permeates the desert air. The sun begins to set and country folk guitar pickers stuff the insides of various establishments with their Bob Dylan meets a rancher’s campfire sound. My Lady, Renée, and I hop bar to bar, from hill to hill, before retiring before the night grows too deep, eager to get up the many trails that climb the surrounding mountains and stairs that wind between residences in the morning. There are few truly unique places left in America, where no chain stores have been able to find acceptance, where the outside world’s influence and desire to homogenize every town into something recognizable enough to make it comfortable for the average tourist to experience without really leaving their comfort zone. 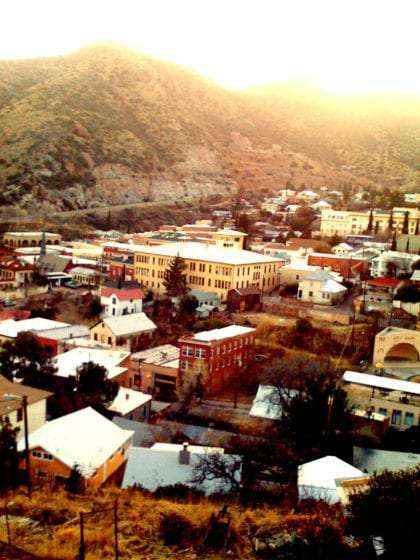 Bisbee is one of the last of those places, where you don’t need to be a type, you don’t need to have a fat wallet or hide your particular backstory. Come, eat, drink, hike, mingle, and just live.